Paradise Design Sculptures have been made using a concrete composite. Various options for your individual garden, entrance, driveway, patio or courtyard can be considered. Do you want a focal point, viewed from window, long distance view, three dimensional viewing or mainly from one side? A sunny position will highlight the carved effects. Night lighting will give another dimension for your sculpture compared to the day time. See our Display Ideas in our Image Gallery menu. We can offer you advice on site in your garden, send us a picture and if we personally deliver your sculpture we will set it up in the best position. Hard garden surfaces often suffice, and bark chip mulch or a couple of concrete blocks are often fine also. Raising your sculpture above the soil line keeps the base clean. A flat surface can also be prepared using a concrete paver for smaller sculptures. Larger pieces can have a flat cast concrete surface if desired. Hardware shops sell premixed concrete – just add water. If security is an issue you may choose to fix your sculpture permanently in position. This can be done by joining it onto a flat concrete surface or paver with a smear of concrete or glue. Our sculptures will remain largely in original condition if sited in full sun. They can be cleaned using water and a scrubbing brush, or water blasted on a gentle setting. 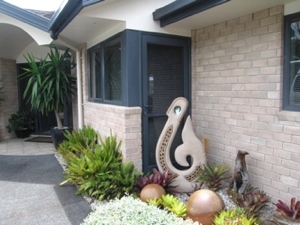 Painting with a clear coloured concrete sealer is an option to protect your sculpture if it is displayed in a less sunny position or under trees where mild discolouration may occur. Mineral based sealers will give a slightly darker look. Silicon based sealers will largely preserve the original effect. Highlighted areas including paua shells have a mineral based paving sealer on them to enhance colour. This may be renewed with a small brush to restore lustre, if you choose in future years. Most of our sculptures can be handled by one or two people. A furniture trolley with padding is what we use for most of our pieces. Transport with padding to avoid rubbing and move the sculpture slowly. Brains not brawn! Chips or scratches can easily be repaired using coarse sandpaper, as the sculpture material is consistent throughout the sculpture on most of our designs. Some new designs feature a coloured concrete or oxide surface layer, and more care needs to be taken when handling them.